Despite Prime Minister Putin’s international warrant for the arrest of Soros, the former Nazi collaborator and defiant Communist imposes his presence in Moscow, despite the opposition of Russian and American nationalists. Are Rothschild with $500 trillion and the billionaire Soros so powerful? It won’t be long and all manner of hell for Russian society, which Soros still inflicts on America, will be cruelly manifested on the Russian people. For too long, patriotic and Constitutionalist Americans have endured the Divide and Conquer strategies of Soros! And it is all contrived even in Moscow, through the globalist-funded Fake News to put even more blame on Russia! 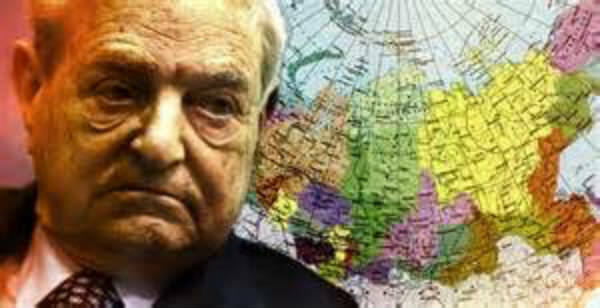 And while Soros the agent continues to build an overt presence of troops in the Ukraine – making the statement his influence reigns over Canadian, American and UK troops – the incremental and covert presence of Soros could perhaps be even more damaging to Moscow… Globalist-elite socialists and communists are united for California secession and a divided, enslaved Russia. Concerned populist America scratches its head and ask, “Why does not Vladimir Putin, of all people, with extraordinary KGB experience and his insightful powers of intelligence, not see the dangers of the Soros ‘California Embassy’ in Moscow? Could Putin, often seen in photos in Masonic garb with George W. Bush – rumored to have accepted invitations to Bush’s South America enclave for clandestine globalist meetings – actually be complicit with the globalist elite? Or is it, the American people ask, Prime Minister Putin grows weak and pale when thinking of Rothschild and Rockefeller? Is Putin so weak he would acquiesce to the globalist inklings of the Moscow-entrenched California Embassy? And even allow Russia to be blamed for the Moscow embassy imposed by globalists? Why waste time with sending Russian troops to the Ukraine to fight Soros troops, when Russia’s real demise will occur in Moscow? Needless to say, the vast majority of Americans strongly desire nationalist Russia and nationalist America to get along. Americans in the know absolutely admire the patience and restraint Vladimir Putin gloriously displayed, when baited and agitated into war to activate Martial Law for Obama to become a black FDR. Such strong Putin character is nothing less than regal and true history books must reflect this! But Americans continue to ask, “Does this embassy in Moscow, socially engineered to be perceived as an ikon of a crumbling America, ultimately molded for the destruction of Moscow and Russia and the United States – is this a rook in a chess game? Is Vladimir Putin playing both sides, catering to both globalist elite and American populists? Can Soros play chess better than Putin? Or will Vladimir Putin once again shine with unparalleled insight and show a regal character in its banishment?